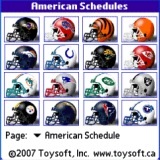 With the NFL Season kickoff just a day away, Toysoft has released its mySchedule National Football League schedule 2008 edition. mySchedule NFL includes all 32 National Football League team's regular schedules, AFC and NFC standings and full team rosters. The program also includes TV listings (including DirectTV), exporting to the datebook/calendar, weekly scores and game summaries and updated Vegas betting odds. Registered users will get continuos standing, scores and roster updates though the season for free. mySchedule NFL 2008 v1.2 for Palm OS is available now for $14.95. The program is currently on sale for $9.95 for a limited time. A demo version is also available. People actually buy lottery tickets and call it a game. Anything is possible. yeah...some will even give their money to phony preachers.